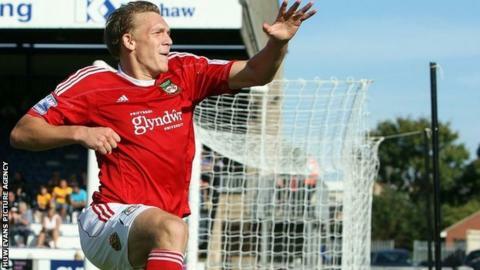 Player-manager Andy Morrell and striker Danny Wright each scored twice as Wrexham outclassed hosts Cambridge. Morrell scored his first of the season from Dean Keates' cross, and Wright extended the lead shortly after the break with a neat finish from 12 yards. Boss Morrell continued his habit of scoring against Cambridge by firing into the top corner. Josh Coulson headed in for the hosts, but Wright sealed the win against his former club with a powerful drive. The win took Wrexham into third place after starting the day fifth, one place above Welsh rivals Newport County. Defeat saw Cambridge drop from 14th to 17th. "I take responsibility for the loss because I'm the manager. "People paid hard-earned money to come and watch us and it just wasn't good enough. We were frustrated with the first goal because [Rossi] Jarvis was fouled. It looked like we didn't mark Morrell but we did, maybe they are cleverer than we are. "That's not an excuse but the first goal didn't help us. "As soon as they scored that first goal the afternoon got harder and harder for us. I'm devastated, I'm gutted, I understand the situation and I know we have to give better than that." "We were very good today. They started very bright, but we managed to score at the right times and we played some fantastic stuff at times. "It was game over after about 20 minutes of the second-half. "We've set our standards quite high. Newport was a good performance at home. "But to come to Cambridge, who are favoured, I suppose - at the start of the season they were probably in the top six, seven or eight teams - to come here and score four and play well is a really pleasing thing for a manager."